CF Le dernier Empereur Personal Regular is a font by PYRS Fontlab Ltd. / Made with FontLab, designed by Steve Cloutier in 2018. Copyright (c) 2018 by PYRS Fontlab Ltd. / Made with FontLab. All rights reserved. This version is for Personal use. For commercial use or more caracters buy a commercial version. Thank you ! 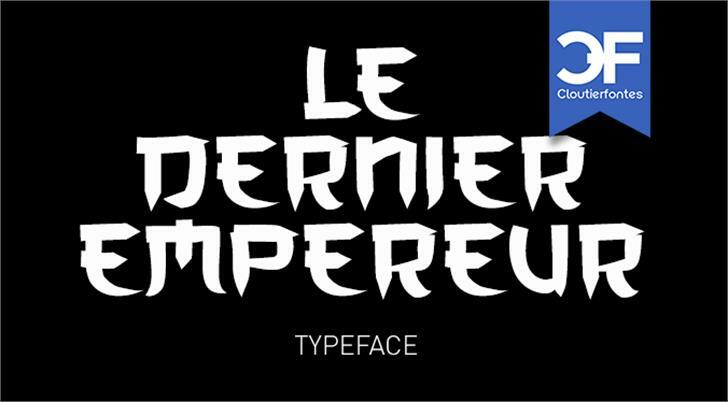 CF Le dernier Empereur Personal is a trademark of PYRS Fontlab Ltd. / Made with FontLab.